Immigration arrests have soared under President Trump. Who is being swept up in the raids? ICE agents still target known criminals in their raids on workplaces and homes, but are now arresting any undocumented immigrants they encounter in those raids. During a series of July raids, in which ICE arrested 650 people, 70 percent weren’t targets of the raid, but were simply in the wrong place at the wrong time. ICE is also going after “low-hanging fruit,” undocumented immigrants known to agents. This includes the 1.8 million undocumented immigrants who have been granted a stay of deportation for medical or family reasons provided they show up for semiannual checkins with ICE agents. Some of them are now being arrested at their check-ins. In one widely publicized case, Guadalupe García de Rayos of Phoenix, a mother of two U.S.- born children who has lived in the U.S. for more than 20 years, was detained at her annual check-in and deported to Mexico the next morning. There’s widespread fear in immigrant communities, with many going deeper underground to avoid the possibility of getting caught up in ICE’s web. “We’re terrified of being separated,” said Nathaly Uribe, a 22-year-old DACA recipient whose parents are undocumented. 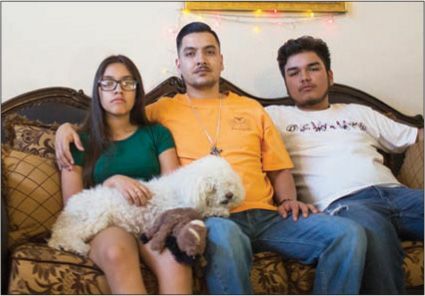 “We live in daily anxiety and terror of being deported.” At one high school in Durham, N.C., enrollment dropped 20 percent after a student from Honduras was arrested on his way to school. It’s still against ICE policy to raid “sensitive locations” such as schools and hospitals, but emboldened agents are pushing the envelope. In one case, Border Patrol agents arrested a 10-yearold girl while she was in an ambulance on the way to the hospital to receive emergency surgery related to her cerebral palsy, with armed guards placed outside her hospital room. “They spent so much time and resources to follow this girl, to treat her like she was the highest-priority criminal that ever walked on this earth,” said Priscilla Martinez, an immigration activist. What’s the justification for that? Immigration agents say they’re just following the law. Lawmakers “should have the courage and skill to change the laws” if they don’t like what they require, Kelly said in April. “Otherwise they should shut up and support the men and women on the front lines.” Many immigration agents feel “unshackled,” according to several news stories, with the unions representing ICE and the Border Patrol reporting soaring morale now that the federal government isn’t micromanaging whom they arrest. That depends on the goal. The pace of illegal immigration to the U.S. has slowed dramatically, at least partly because of the perception that this administration is serious about deporting those who are caught. But while arrests are up, the U.S. is actually on pace to deport fewer people this year than under the last year of Obama’s presidency. The surge of arrests has badly overloaded the already strained immigration courts, which now face a staggering backlog of 630,000 cases. The Trump administration is making a push to hire more immigration judges, but it could be years before many of those awaiting a hearing exhaust all of their appeals. Does ICE’s campaign face other obstacles?